On the evening of October 24, the Hemingway-Pfeiffer Museum and Educational Center in Piggott held a benefit dinner at the Fowler Center in Jonesboro. The event was called “The Hemingways’ Paris” and featured a Parisian dinner and winetasting, with Bruce Cochran of Jonesboro serving as sommelier. Continuing with the Paris theme, the museum will lead a trip to the Hemingways’ Paris from March 22-30. On the Left Bank, they will walk in the footsteps of the artists of the Lost Generation: Gertrude Stein, Cole Porter, Pablo Picasso, and of course Ernest Hemingway. On the Right Bank, they will explore the world of Parisian fashion that Pauline Pfeiffer covered for Vogue magazine. They will see the world of Coco Chenal and Scott and Zelda Fitzgerald. In addition, they will visit other major Paris sites, as well as Versailles, Giverny, and Normandy, where Ernest covered the 1944 Invasion as a journalist. The trip is open to the public, but space is limited and expected to fill up fast. The cost is $3198/person (land package, double-occupancy). To register for the trip, or to get information, contact the museum. This is the second educational trip offered by the museum. Last May, 34 travelers explored Hemingway’s Cuba. Friday’s dinner featured an art exhibition by one of those travelers, Prof. James Richards of Fort Worth. 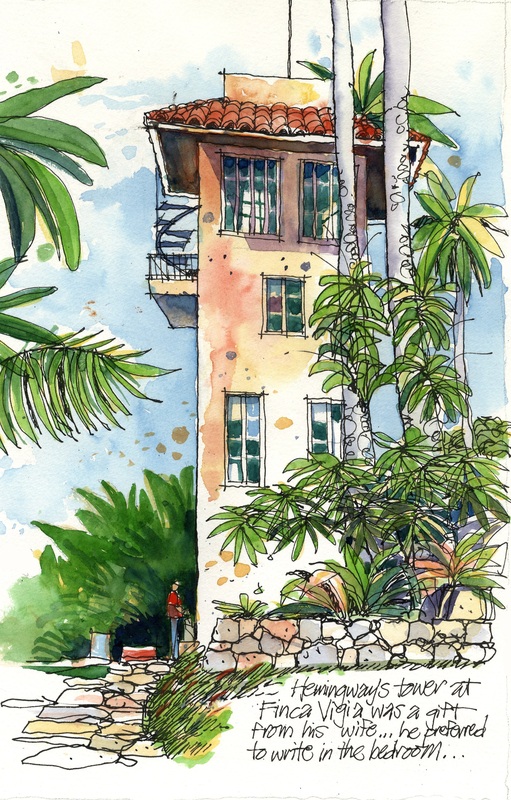 His watercolors of Cuba can be seen on the third floor of the Ellis Library on the campus of ASU until Nov. 14. The exhibition is free and open to the public. “Hemingway’s writing an life have long beckoned the adventurous in spirit. Likewise, Cuba is a place of fascination for intrepid travelers, in part because Hemingway’s spirit remains a palpable presence there. In May 2014, the Hemingway-Pfeiffer Museum and Educational Center’s tour Hemingway’s Cuba provided both access to and excellent interpretation of this fascinating place and its connections to one of the giants of American literature.